What is the reward for believers? You might be surprised the reward isn’t Heaven. We discuss the scriptural teaching about our ultimate reward (and ultimate motivation) in this section drawn from THE REVEALING: UNLOCKING HIDDEN TRUTHS ON THE GLORIFICATION OF GOD’S CHILDREN. Heb 12:18-24 18For you have not come to the mountain that may be touched and that burned with fire, and to blackness and darkness and tempest, 19and the sound of a trumpet and the voice of words, so that those who heard it begged that the word should not be spoken to them anymore. 20(For they could not endure what was commanded: “And if so much as a beast touches the mountain, it shall be stoned or shot with an arrow.” 21And so terrifying was the sight that Moses said, “I am exceedingly afraid and trembling.”) 22But you have come to Mount Zion and to the city of the living God, the heavenly Jerusalem, to an innumerable company of angels, 23to the general assembly and Church of the firstborn who are registered in heaven, to God the Judge of all, to the spirits of just men made perfect, 24to Jesus the Mediator of the new covenant, and to the blood of sprinkling that speaks better things than that of Abel. The writer of Hebrews says that we believers have come to Mount Zion, also calling it the City of the Living God, the Heavenly Jerusalem, and the Church of the Firstborn. These are all terms for the Church… for believers… those that call upon the name of Jesus Christ! This does not consist in merely the location in the sky to which we will someday go. Heaven is a place. However, the reward goes beyond living in the “sweet by-and-by.” The reward is found among the assembly of who we are, the Church, as it is meant to be, even today. Heb 11:10 for he waited for the city which has foundations, whose builder and maker is God. Heb 11:16 But now they desire a better, that is, a heavenly country. Therefore, God is not ashamed to be called their God, for He has prepared a city for them. Heb 13:14 For here we have no continuing city, but we seek the one to come. Even now, the Church is not yet built into that complete city. God continues in the process of building it. When the Church receives her inheritance, she will be that permanent city. Jerusalem is that city. But that city comprises believers from all time who become glorified – that they may dwell there. Jerusalem isn’t just a place, it is a people! Gal 4:26 Jerusalem above is free, which is the mother of us all. Here in Galatians, Paul refers to “Sarah” which represents the heavenly city of Jerusalem – which we see consists of the those who believe in Christ. Rev 3:12 He who overcomes, I will make him a pillar in the temple of My God, and he shall go out no more. I will write on him the name of My God and the name of the city of My God, the New Jerusalem, which comes down out of heaven from My God. And I will write on him My new name. 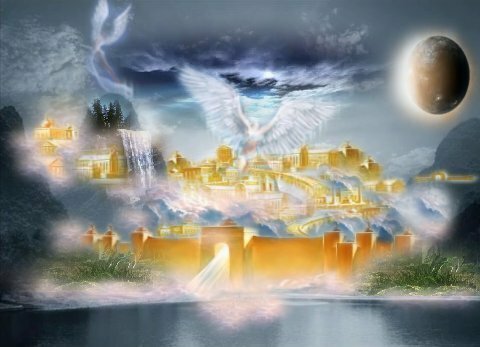 Rev 21:2-3 2Then I, John, saw the holy city, New Jerusalem, coming down out of heaven from God, prepared as a bride adorned for her husband. 3And I heard a loud voice from heaven saying, “Behold, the tabernacle of God is with men, and He will dwell with them, and they shall be His people. God Himself will be with them and be their God. Rev 21:9-14 9Then one of the seven angels who had the seven bowls filled with the seven last plagues came to me and talked with me, saying, “Come, I will show you the bride, the Lamb’s wife.” 10And he carried me away in the Spirit to a great and high mountain, and showed me the great city, the holy Jerusalem, descending out of heaven from God, 11having the glory of God. Her light was like a most precious stone, like a jasper stone, clear as crystal. 12Also she had a great and high wall with twelve gates, and twelve angels at the gates, and names written on them, which are the names of the twelve tribes of the children of Israel: 13three gates on the east, three gates on the north, three gates on the south, and three gates on the west. 14Now the wall of the city had twelve foundations, and on them were the names of the twelve apostles of the Lamb. 16 After this I will return, and will build again the tabernacle of David, which is fallen down; and I will build again the ruins thereof, and I will set it up: 17That the residue of men might seek after the Lord, and all the Gentiles, upon whom my name is called, saith the Lord, who doeth all these things. These verses all speak of the Church but are commonly mistaken for descriptions of Heaven. Notice the New Jerusalem is prepared as “a bride for her husband” in Revelation 21. In verse 9, the angel says he will show John “the bride, the Lamb’s wife.” What does he show John as the bride? The great city, the Holy Jerusalem, descending out of heaven from God, having the glory of God. This is not heaven, but rather comes down from heaven, and dwells on or exceedingly close to earth. The great city, the New Jerusalem is the bride of Christ. When Jesus returns to the earth with His holy ones in glory (remember saints means “holy ones” and that includes all believers), that is a partial fulfillment of the New Jerusalem coming down from heaven to the earth. There have been many false distinctions made between the “place” of heaven, the New Jerusalem, and finally, of where and what believers consist. First off, a common mistake asserts heaven is the residence of all believers. Not so. Heaven can mean many things in the Bible, but we must not mistake it for the New Jerusalem which actually is the residence of all believers. (Be mindful that ultimately no differentiation in eternity (after the Millennium) exists between the Church and believers from all ages). Next, the usual perspective separates the place from the people that comprise the New Jerusalem. The Scripture equates the two. It is not an easy concept for us to grasp – that the glorified believers and the city itself are identified as essentially “one and the same.” Certainly, we can reckon that glorified believers would make the city gleam. But the connection is more than that. This composition of the city as the glorified believers and not just the “pearly gates” is what Scripture teaches and is a cornerstone of the book you are reading. (See the “Deep Dive” at the end of chapter 9, The New Jerusalem, for a detailed explanation of the “city”). Previous PostTHE REVEALING: A DEEP STUDY ON THE MOST VITAL PROPHECY EVERY CHRISTIAN SHOULD KNOWNext PostDENVER PROPHECY SUMMIT, AUGUST 4-6, NOW FREE!